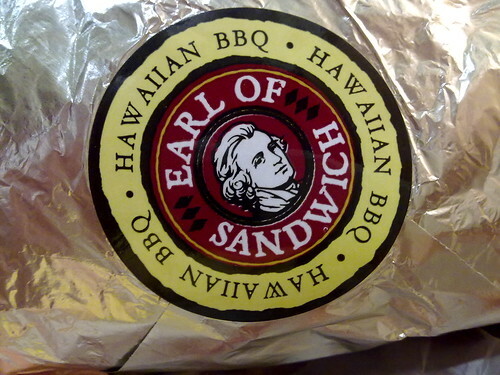 Dining with the Earl at Downtown Disney, originally uploaded by Erin *~*~*. If you’re going to blow your diet, then this is the way to do it! 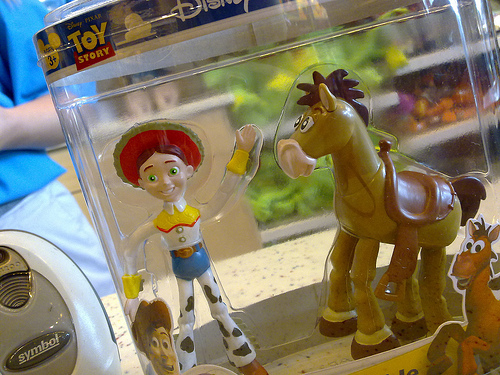 To join Woody and Buzz, originally uploaded by Erin *~*~*. 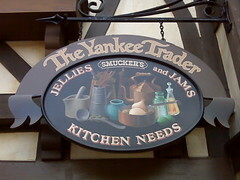 a Dowtown Disney MUST shopportunity, originally uploaded by Erin *~*~*. The Nieceling has never been to Tren-D. I know, shocking. 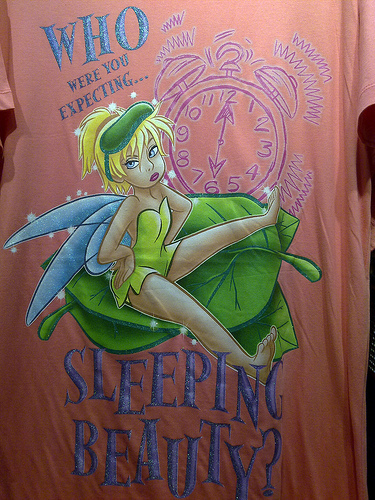 Fortunately, Auntie Tink is here to remedy the situation. Now entering Heaven, originally uploaded by Erin *~*~*. 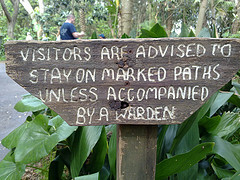 There is a place deep in the Pangani Forest of Disney’s Animal Kingdom where mere mortals fear to tread; where unspeakable horrors lurk in the bush; where destruction and mayhem breed. 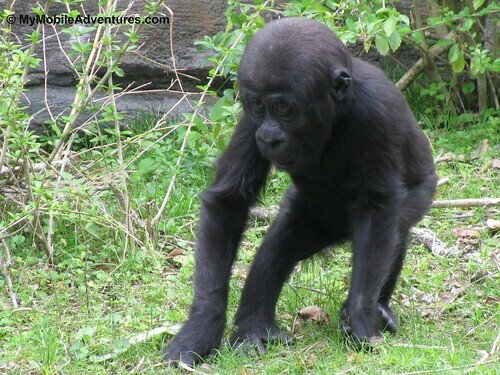 Here, in the heart of the lowland gorilla tribe, we find *cue scary music* LILY, THE TODDLER OF TERROR! Well, the official portion of the interview was over right then and there. 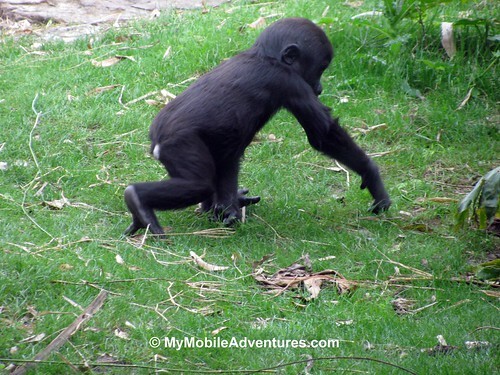 However, through the miracle of modern-day paparazzi-ism, My Mobile Adventures *~*~* is proud to bring you this (not very) exclusive video of the Toddler of Terror, foraging around with her mama. Take it away, Lily! 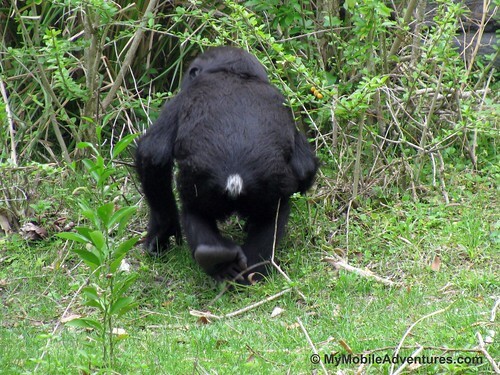 [video] Move It, Shake It, Celebrate It! See ya real soon, originally uploaded by Erin *~*~*. 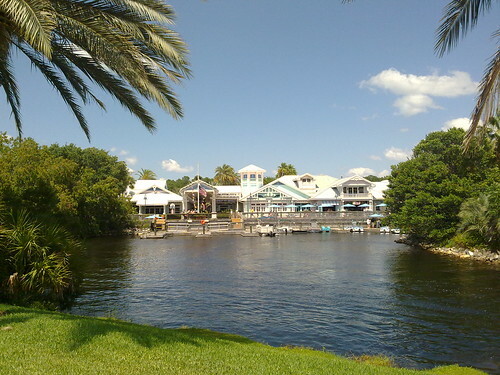 A last look at Disney’s Old Key West, originally uploaded by Erin *~*~*. What a pretty, laid back resort this is. 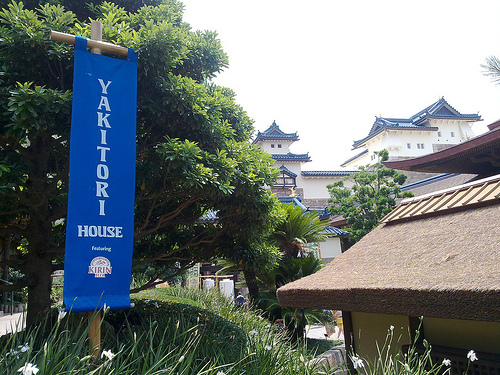 I hope to have the opportunity to stay here again some time. 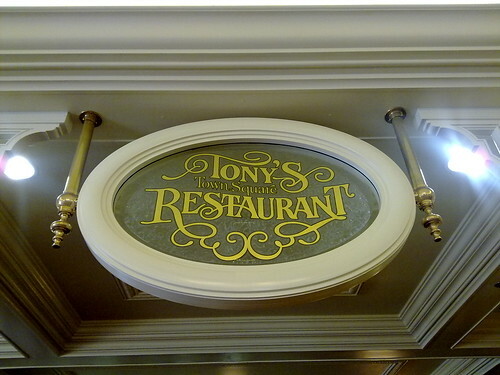 The salmon at Tony’s in the Magic Kingdom is a hit, originally uploaded by Erin *~*~*. 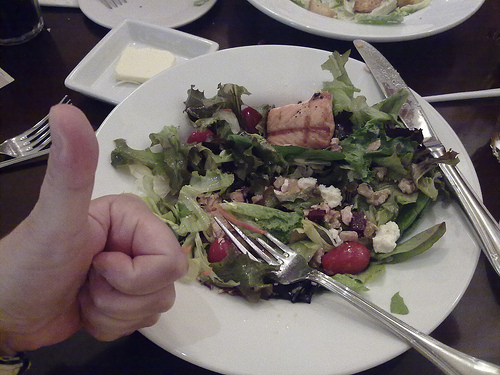 It was fresh and flaky, and prepared with a subtle orange dressing. Loved it! 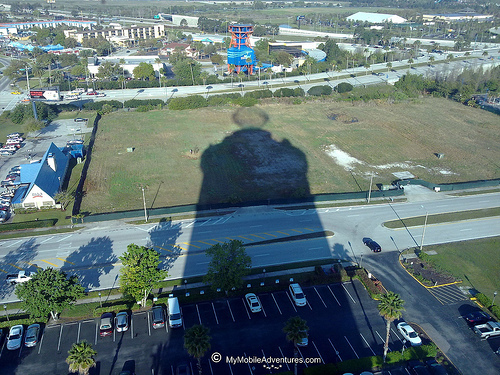 Time to await my chariot – Goodbye, Magic Kingdom! 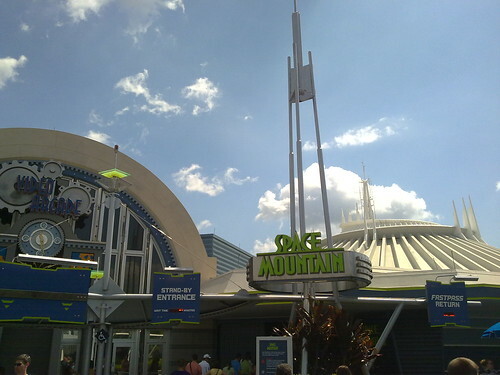 Time to await my chariot – Goodbye, Magic Kingdom!, originally uploaded by Erin *~*~*. 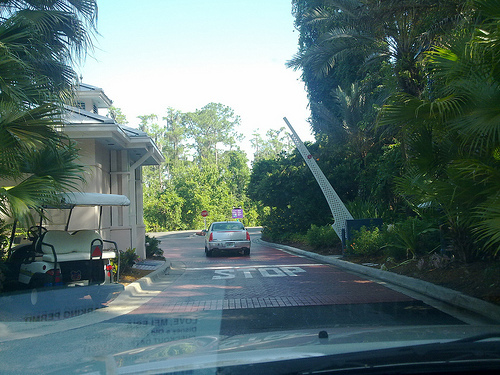 Monorail crossing, originally uploaded by Erin *~*~*. Sadly, I must do this now, originally uploaded by Erin *~*~*. 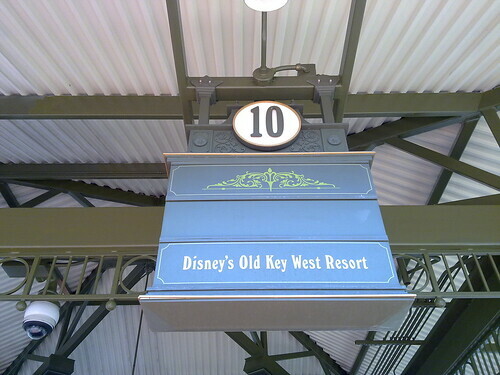 Walt Disney World Railroad Tour, originally uploaded by Erin *~*~*. We are stuffed from Tony’s and decided to take a turn around the Magic Kingdom on the Walt Disney World Railroad. Dees ees-ah da night, eets-ah beautiful night…, originally uploaded by Erin *~*~*. We want to color! But we have no coloring sheets, just crayons. The walls are white… LOL! 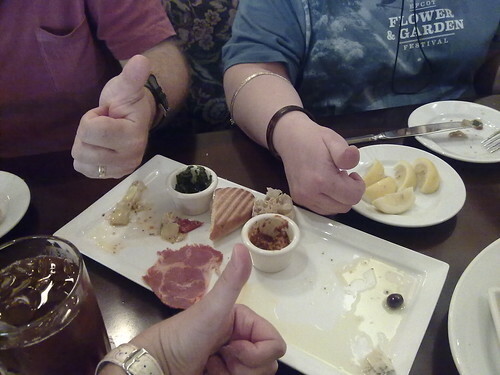 Taste of Italy at Tony’s, Magic Kingdom, originally uploaded by Erin *~*~*. 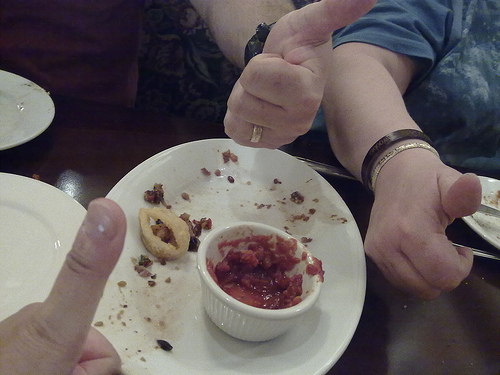 Fresh and Tasty – Tony’s Calamari, originally uploaded by Erin *~*~*. It’s lunchtime in the Magic Kingdom, originally uploaded by Erin *~*~*. 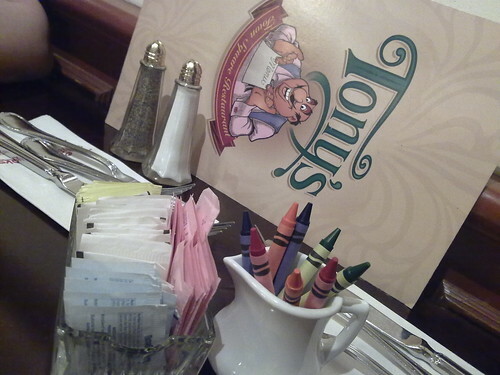 I think the last time I ate at Tony’s was 1985! 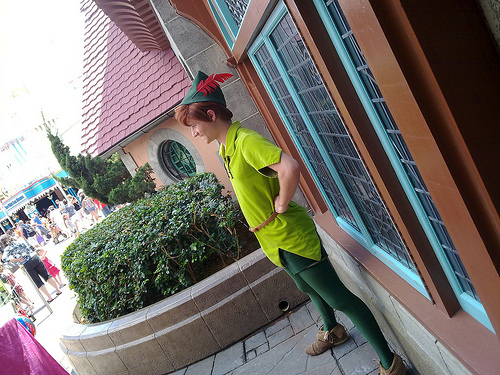 Boy they sure party a lot in Disney’s Magic Kingdom, originally uploaded by Erin *~*~*. Here comes that pumpin’ partyin’ parade again! My BF , originally uploaded by Erin *~*~*. 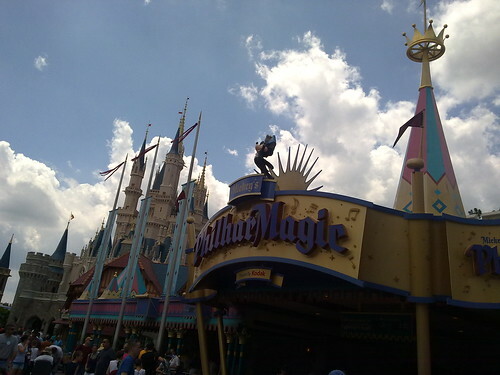 Fantasyland in the Sky, originally uploaded by Erin *~*~*. 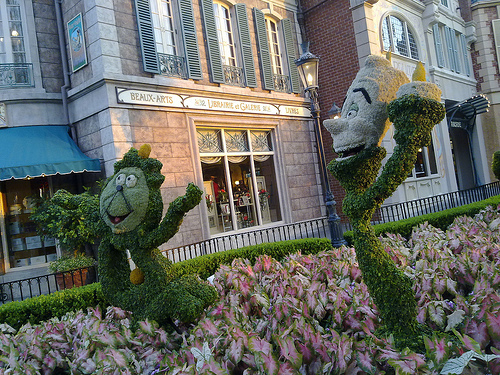 It’s starting to be a zoo up here in Fantasyland. 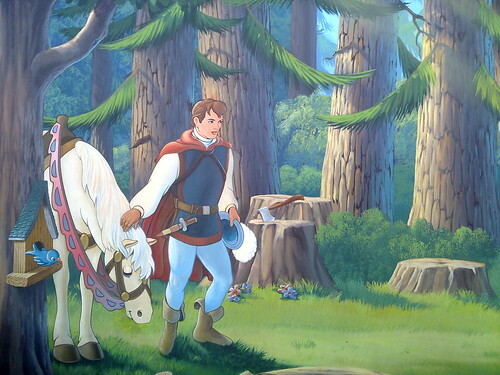 We cannot cut through the castle for some reason so we have to go around. I’m wishing…., originally uploaded by Erin *~*~*. 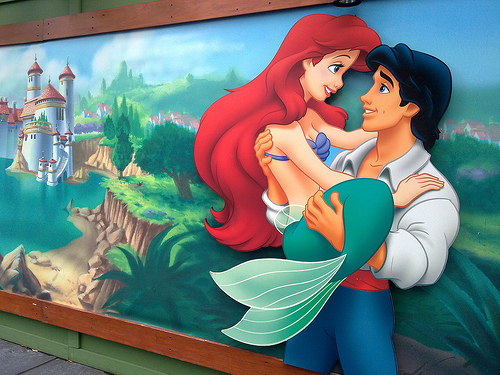 Kiss The Girl!, originally uploaded by Erin *~*~*. For your safety…, originally uploaded by Erin *~*~*. 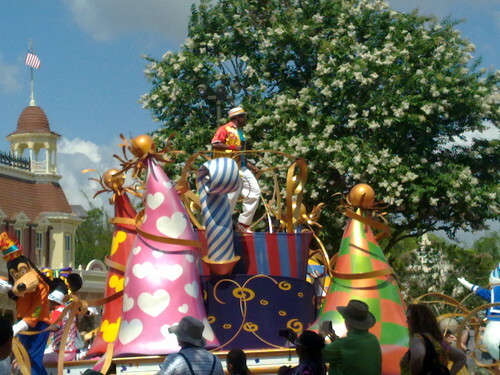 Let’s Get This Party Started at Magic Kingdom, originally uploaded by Erin *~*~*. Bye bye Old Key West, originally uploaded by Erin *~*~*. 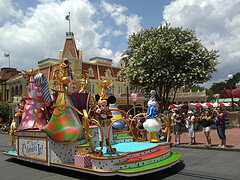 Tried to drive to Magic Kingdom to meet Chez Bro and SIL but there was heavy traffic due to triathlon. Came back and dumped car at Old Key West again and took the looooong bus ride the round-about way. Finally in the park! 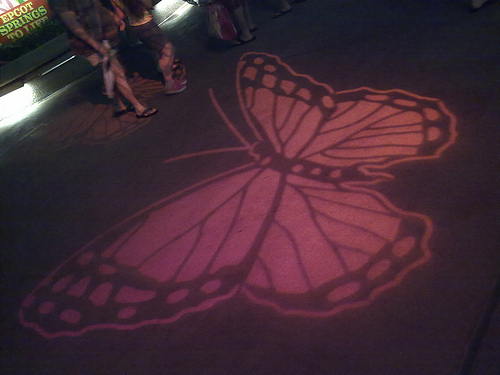 Butterfly at the EPCOT exit, originally uploaded by Erin *~*~*. 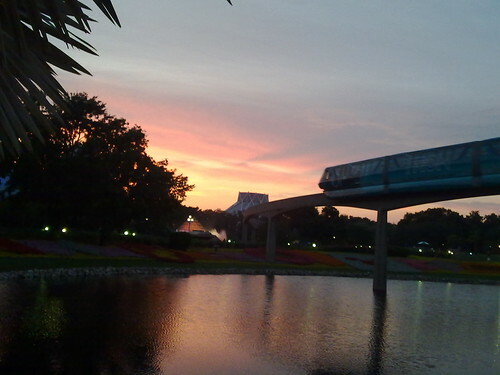 Tronorail Sunset, originally uploaded by Erin *~*~*. I stood here and prayed for a lot of things. "Please God, let the colors last until the monorail comes. 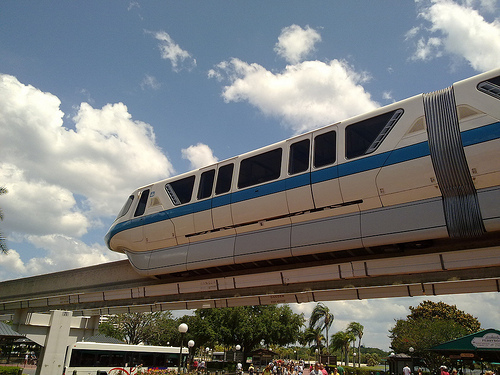 And please God, let it be the Tronorail. " Once Upon A Dream, originally uploaded by Erin *~*~*. Found the sun just in time for sunset, originally uploaded by Erin *~*~*. 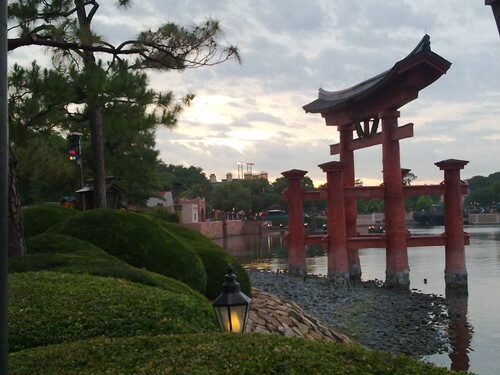 It’s going down over Disney’s Yacht Club and sending a last few rays into EPCOT’s France. 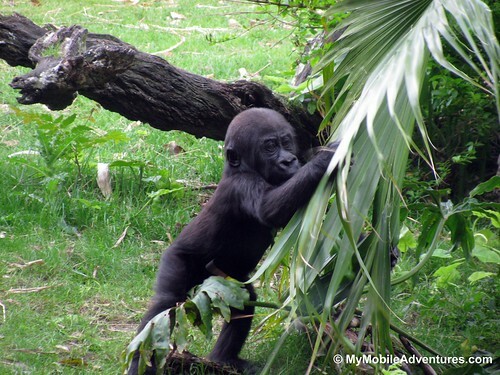 I expect it to get colder as soon as it sets – it’s quite chilly already! 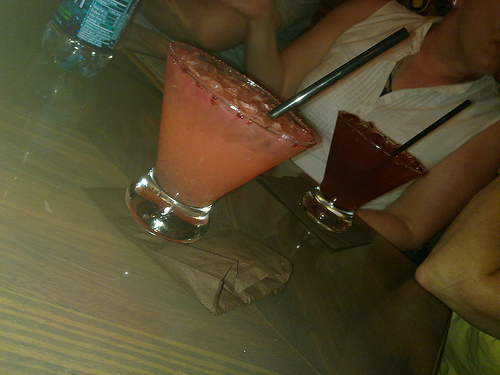 Our reward for getting drenched in Walt Disney World, originally uploaded by Erin *~*~*. Minnie Mouse in the Mustard, originally uploaded by Erin *~*~*. 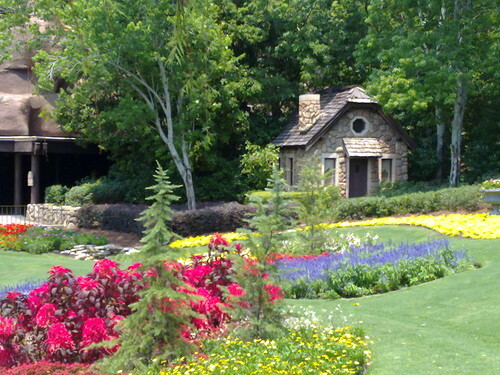 american Adventure – Community Gardens Are Blooming, originally uploaded by Erin *~*~*. Something Tells Me I’m Into Something Good, originally uploaded by Erin *~*~*. 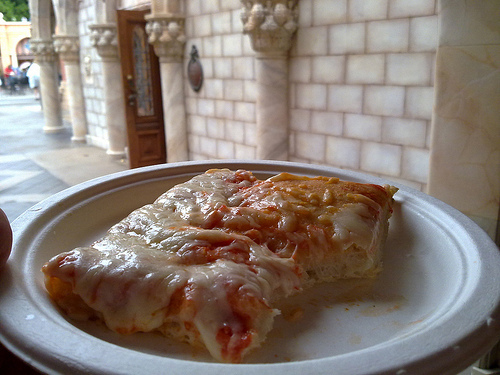 Review: by-the-slice pizza at EPCOT’s Via Napoli, originally uploaded by Erin *~*~*. 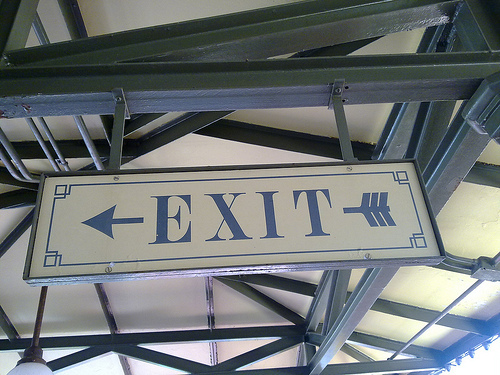 Don’t do it. If I had any free hands, this would have gotten a big thumbs DOWN. However, it is raining on and off and no one has been by to squeegee the outdoor tables. 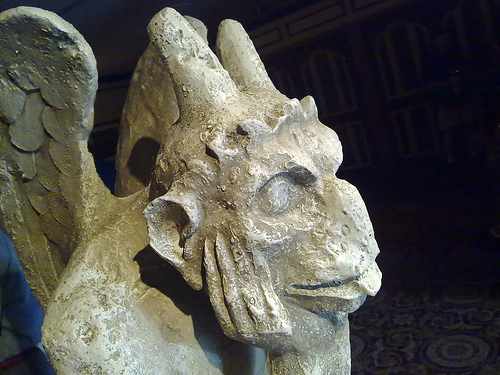 Not wishing to put my plate down in a puddle, I took cover in that alcove near the stairs with the lady’s head on the bannister. The "crust" – and I use that term loosely, since there isn’t anything remotely "crusty" about it – is bready, which is typical of Sicilian-style pizza. Neapolitan-style pizza does not seem to be available at the window. Since there’s nothing crispy going on anywhere on this thing, the "crust" is a FAIL. If you were expecting more than half a teaspoon of tomato sauce (I was), then you will be disappointed. The cheese at least is pretty fresh. They are clearly making the take out window pizza on the cheap – VERY cheap. I won’t be doing this again unless someone – ok MANY someones tell me that it has improved. 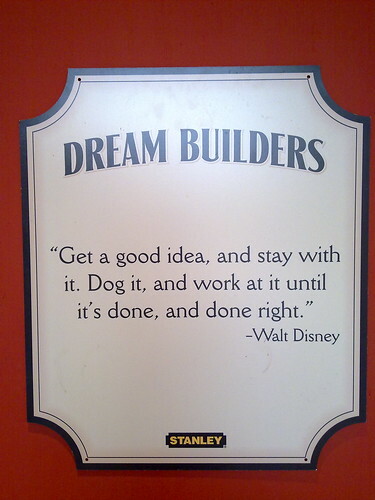 Wise counsel from Walt Disney, originally uploaded by Erin *~*~*. 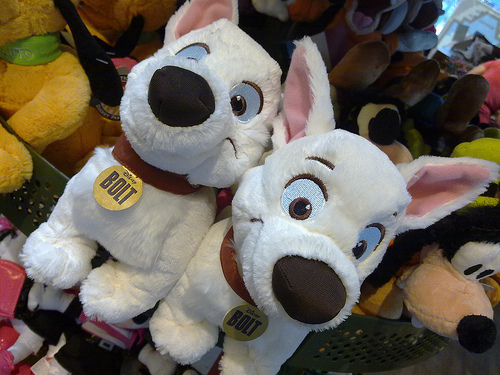 If a Disney fan decides to get a dog…, originally uploaded by Erin *~*~*. …Shouldn’t they get a White Shepherd? And name it Bolt? Vinyl is back, originally uploaded by Erin *~*~*. 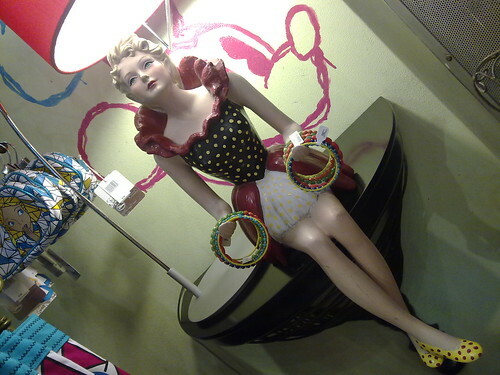 I like this one – I grew up with vinyl "albums"
Rhis is the REAL Tinker Bell, originally uploaded by Erin *~*~*. 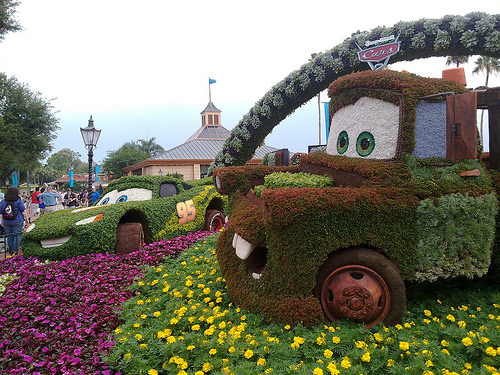 Pixar’s "Cars" stars in topiary, originally uploaded by Erin *~*~*. It’s been fun attending the Flower and Garden Festival on both the first and last weekends of the show. 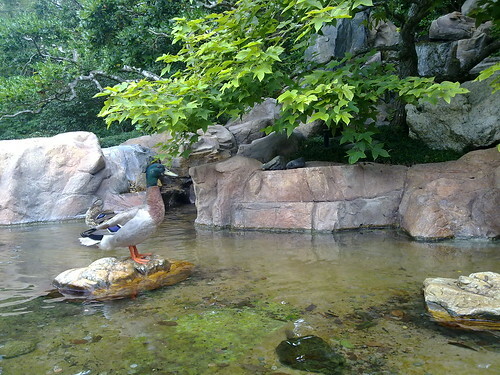 This area evolved quite nicely since that day back in March when I first saw it. 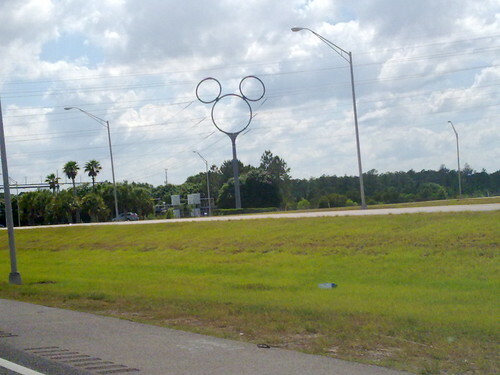 Good job, Disney! 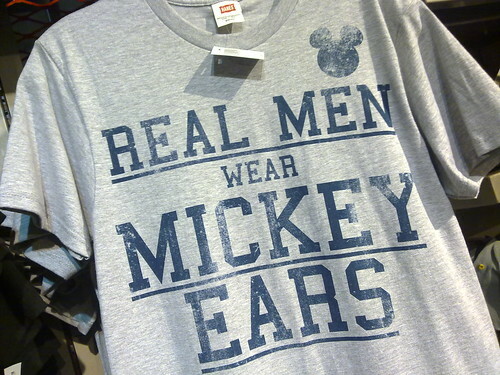 It’s t-shirt time in Mouse Gear, originally uploaded by Erin *~*~*. Still raining, but more gently now. 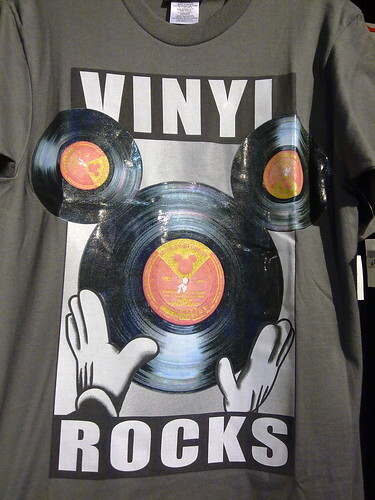 Let’s go browsing and find amusing things in MouseGear. 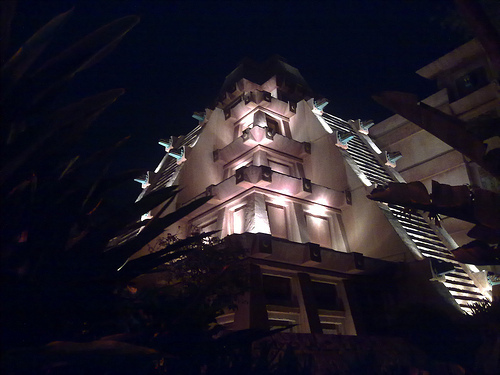 Taking cover in the EPCOT Festival Center, originally uploaded by Erin *~*~*. It’s coming down again. I hope it’s not super-freezing inside. I didn’t get soaked, but I’m still damp enough to feel it. 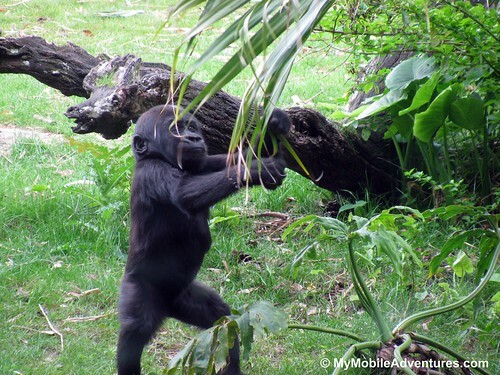 Uh-oh – here comes the rain again! Uh-oh – here comes the rain again!, originally uploaded by Erin *~*~*. I think we’re in for another round, and not the sunshower variety, either. 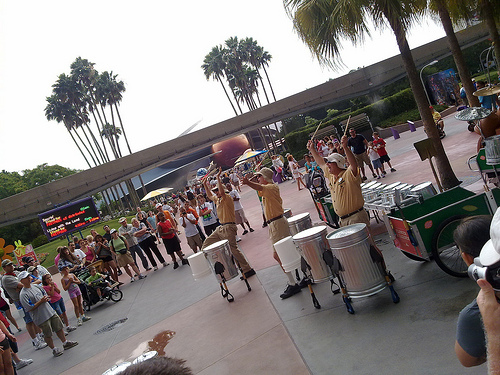 EPCOT drummer dudes, originally uploaded by Erin *~*~*. 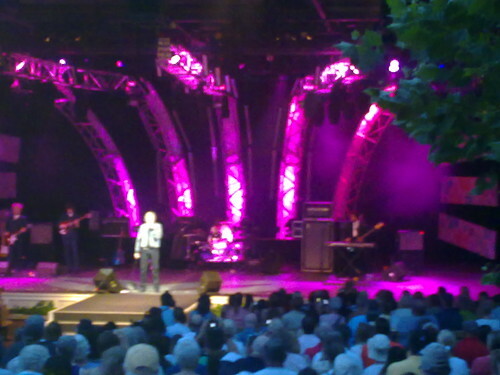 I am on my way to the festival center and stopped to watch these guys perform. They were about as loud as the thunder! 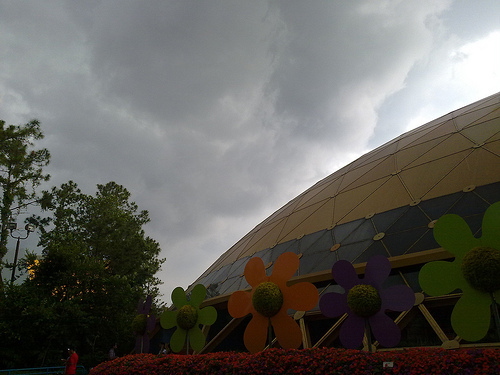 And what’s freakier than sun-der showers in EPCOT? 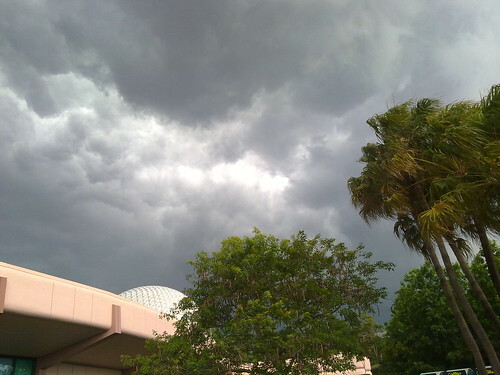 And what’s freakier than sun-der showers in EPCOT?, originally uploaded by Erin *~*~*. 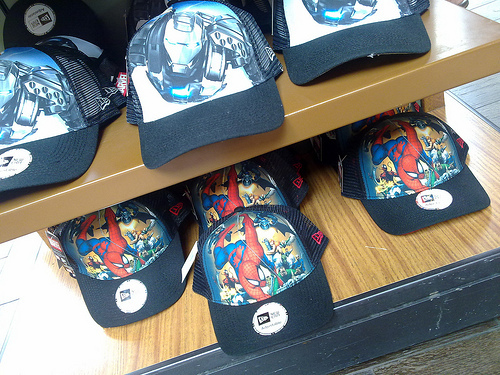 Marvel Comics merchandise for sale in EPCOT! 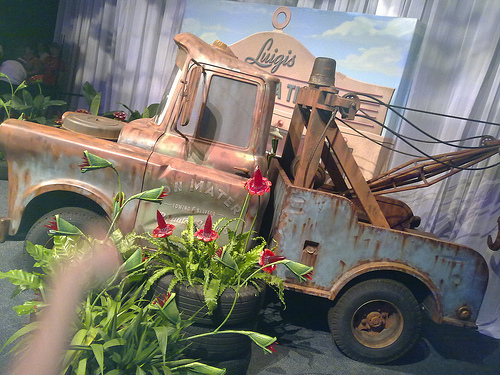 Tow Mater Towing And Salvage, originally uploaded by Erin *~*~*. Found out the next batch of speakers are at 4:00 PM – looking for my brother! It’s just a gianr character meet, originally uploaded by Erin *~*~*. 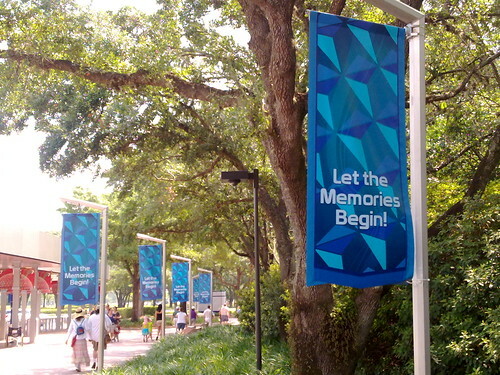 Where in EPCOT Am I? 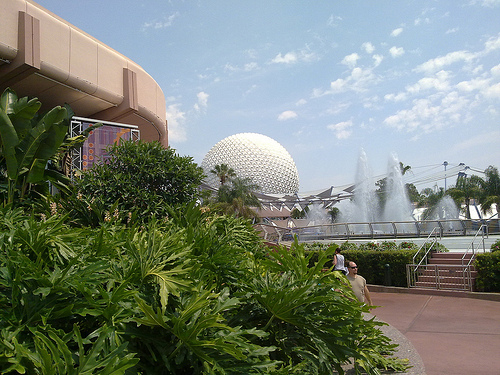 Where in EPCOT am I?, originally uploaded by Erin *~*~*. Storm clouds are forming. The air is by turns stagnant or breezy but still hot, hot, hot. Chez Bro called and said he’s going down to The Art Of Disney store so I’ve sought air conditioning… guess where? 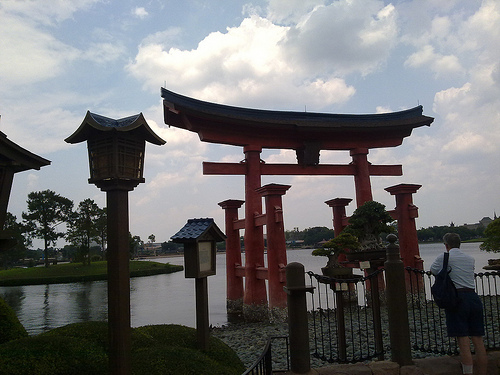 spiritual Gate in EPCOT’S Japan, originally uploaded by Erin *~*~*. I admit a certain fascination with the whole concept of a gate that marks a sacred space and may even be a portal to worlds beyond…. 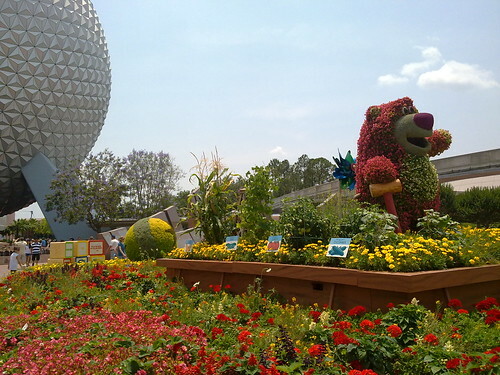 Free flowe seeds from EPCOT’s Butterfly Garden, originally uploaded by Erin *~*~*. 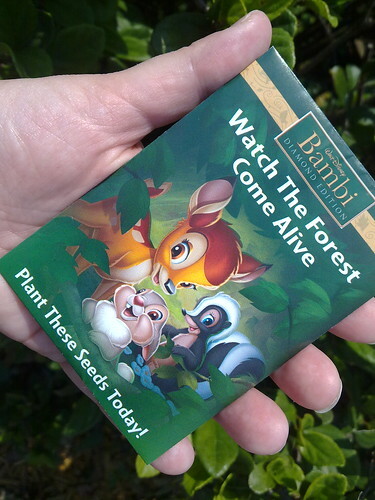 Two cast members at the entrance to the butterfly garden were handing out free seeds. 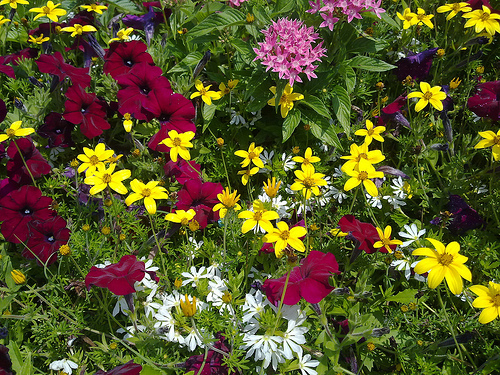 Mine are California zinnias – not sure if there’s more variety than that but I’m happy to have them no matter what they are. 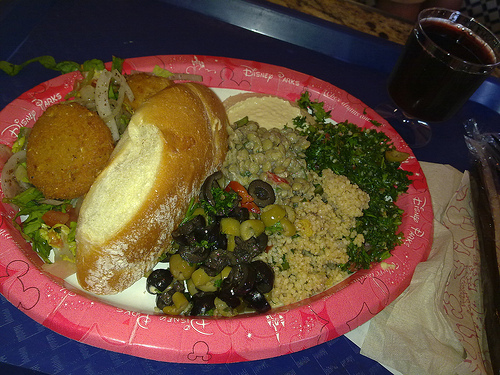 Lunch in EPCOT’s Morocco, originally uploaded by Erin *~*~*. 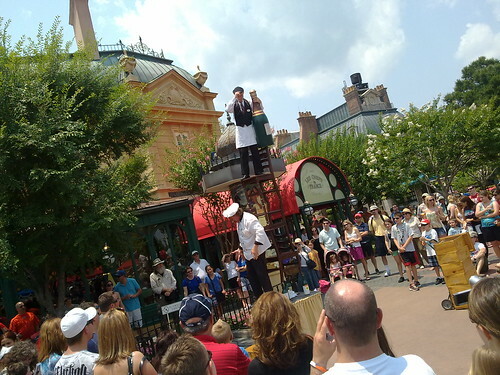 Chair-crobats at EPCOT’s France, originally uploaded by Erin *~*~*. Return of the shoes! In EPCOT’S Canada, originally uploaded by Erin *~*~*. 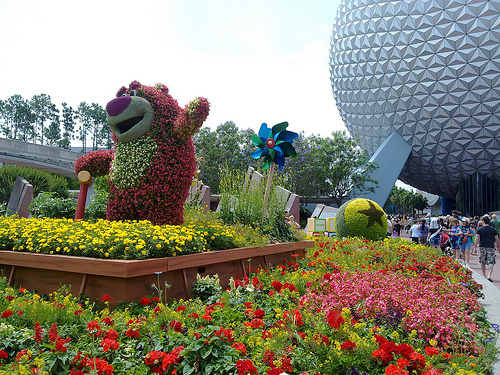 Beautiful as always – EPCOT’s Canada, originally uploaded by Erin *~*~*. 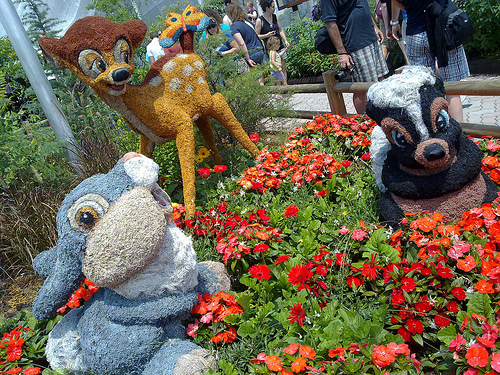 Bambi and the gang in the Butterfly Garden, originally uploaded by Erin *~*~*. 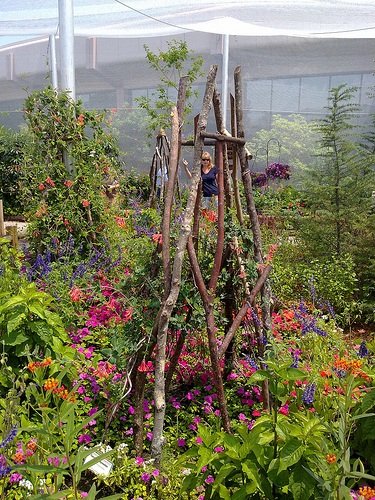 Natural trellis inside the EPCOT Butterfly Garden, originally uploaded by Erin *~*~*. More Freebies from EPCOT’s Flower and Garden Festival, originally uploaded by Erin *~*~*. 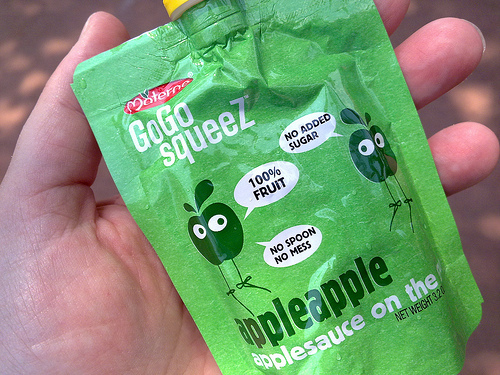 This is GoGo Squeeze – squeezable, no sugar added apple sauce. They’re handing them out free on the Rose Walk, so head over there if you are in EPCOT right now and interested in apple sauce! 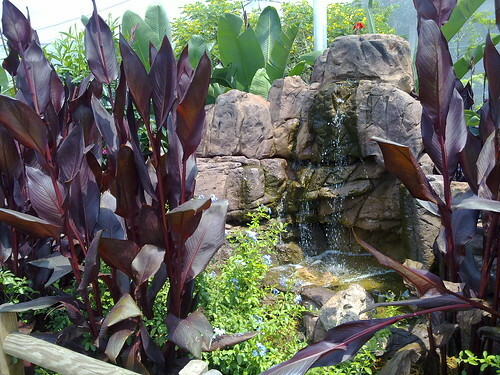 Butterfly Garden Water Feature, originally uploaded by Erin *~*~*. It is pretty hot inside the Butterfly Garden enclosure. It’s made of a breathable mesh but there’s something metalic about it that seems to draw the heat. 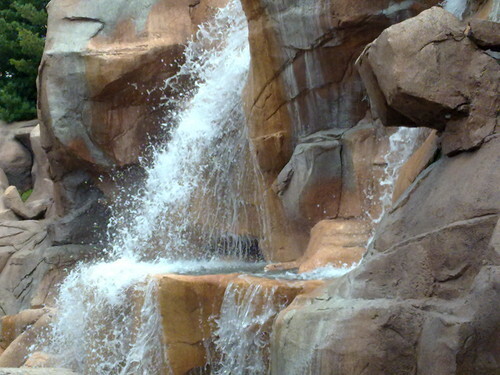 This water feature provides for a soothing bacground gurgle. Butterfly Garden mix, originally uploaded by Erin *~*~*. 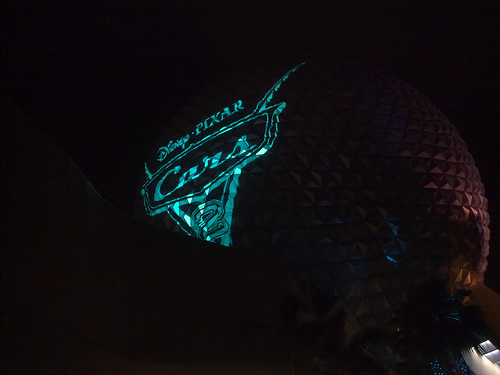 EPCOT Fountain Show begins, originally uploaded by Erin *~*~*. It’s a breezier day today than it has been. Hoping that means less impact from the heat than the last few days. Getting my Beverly fix, originally uploaded by Erin *~*~*. 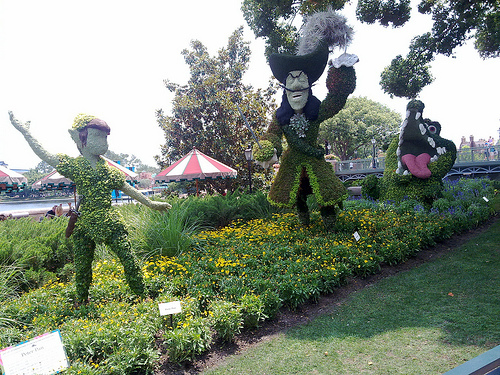 Toy Story Topiary, originally uploaded by Erin *~*~*. 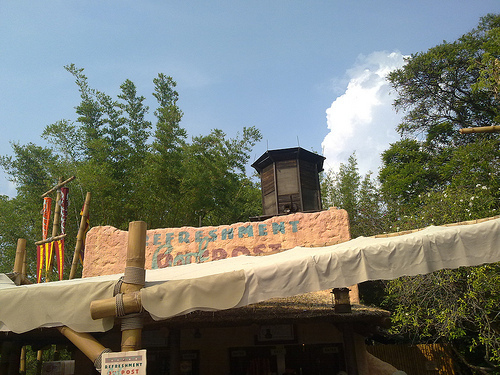 Dear @DisneyParks – more recycling bins, please! 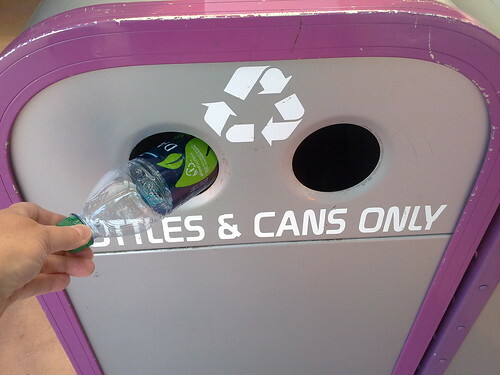 Dear @DisneyParks – more recycling bins, please!, originally uploaded by Erin *~*~*. 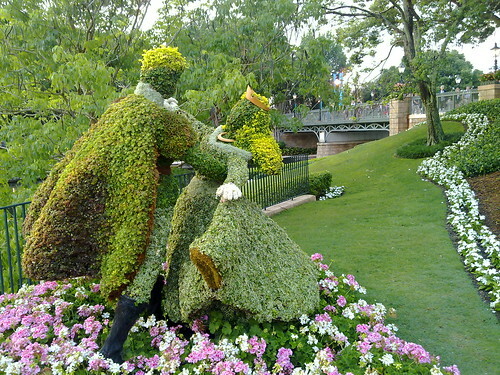 Sometimes I have to carry an empty bottle around Walt Disney World for a good, long while before finding a recycling bin. I love that you do this and I that you would wish you would do it MORE. Thanks! 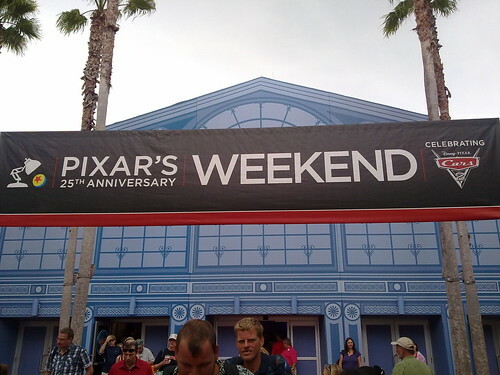 Pixar’s 25th Anniversary Weekend, originally uploaded by Erin *~*~*. 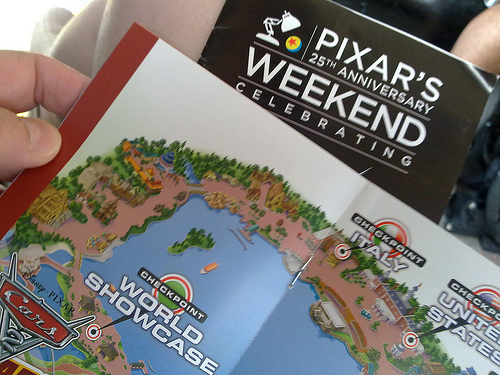 We picked up maps and brochures at EPCOT last night for Pixar’s 25th Anniversary Celebration. 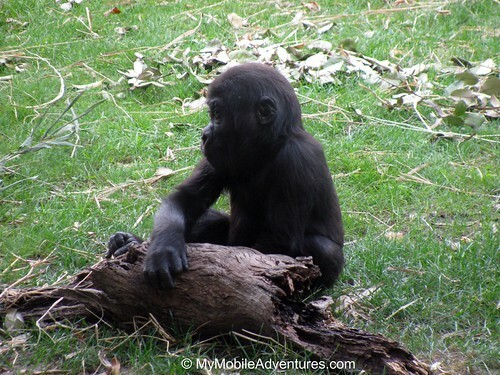 I just remembered they were in my"safari" bag, so I’m going to check it out while riding to the park. 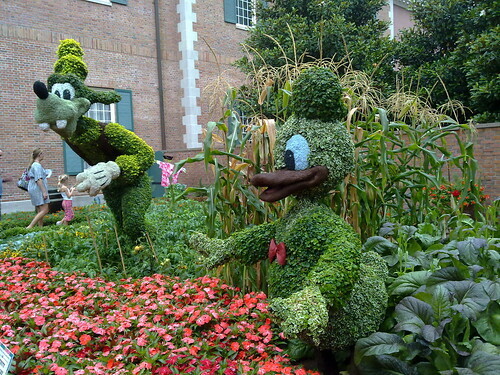 looks like there will be country-appropriate character meets around the World Showcase and some Pixar animators holding speaker sessions. Cars 2 Fanfare, originally uploaded by Erin *~*~*. "Mrs Brown you’ve got a lovely daughter…", originally uploaded by Erin *~*~*. Dinnner ftom the American Adventure, originally uploaded by Erin *~*~*. 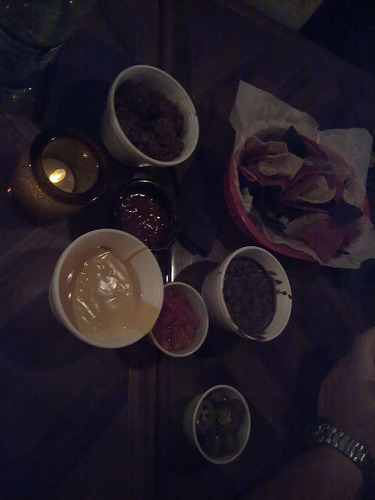 We had so much guacamole and etc. at La Cava, I feel it’s time for a prudent dessert. 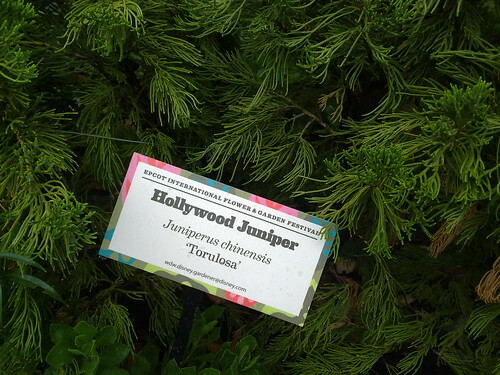 But I wish it was a la mode…. 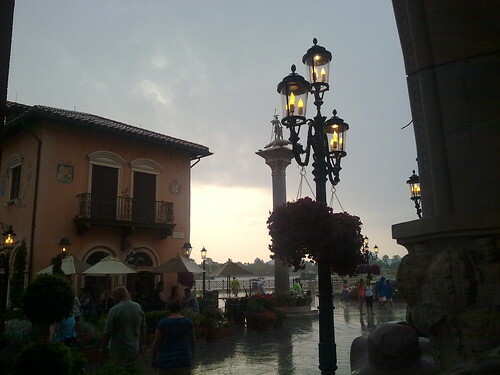 STILL pouring in EPCOT, originally uploaded by Erin *~*~*. Gimmee Shelrer at EPCOT’s Italy, originally uploaded by Erin *~*~*. 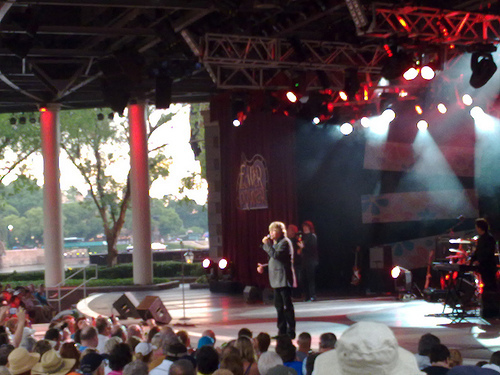 It decided to storm as we were on line for Herman’s Hermits. 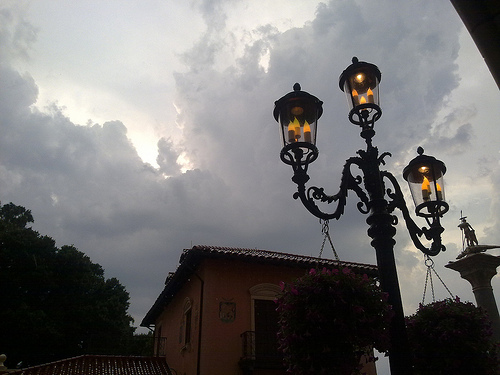 We have sought shelter under the portico in Italy. On the way to Mecca, originally uploaded by Erin *~*~*. 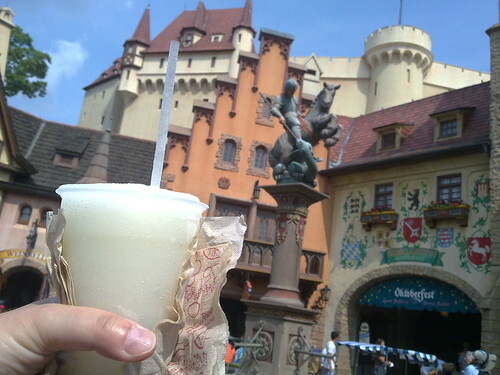 Yes, EPCOT’s Germany sells an "adult slushie", originally uploaded by Erin *~*~*. 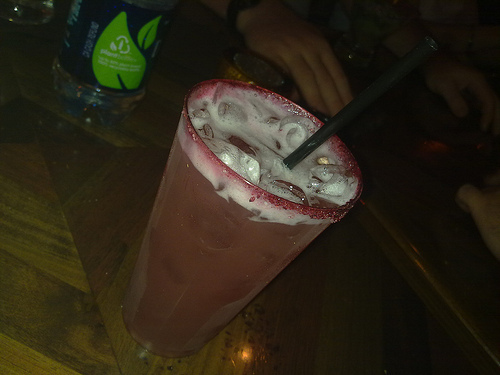 This here is a Lossberg Lemonade. it’s got a cherry liquor running through it. 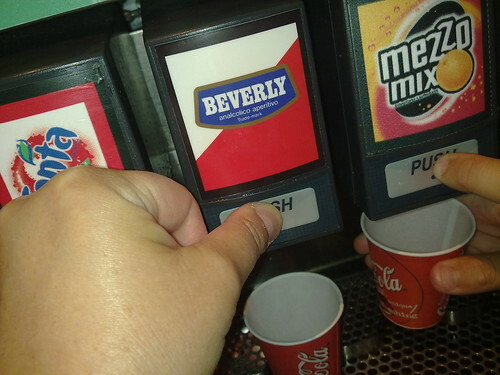 Refreshing! 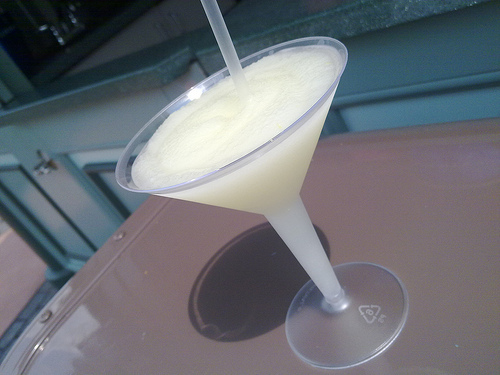 The Walt Disney World Adult Slushie Tour, originally uploaded by Erin *~*~*. It’s tough to be him, originally uploaded by Erin *~*~*. Yakitori duck, originally uploaded by Erin *~*~*. Time for lunch!, originally uploaded by Erin *~*~*. @SpottedMoose Heading Guess Where to do Guess What? @SpottedMoose Heading Guess Where to do Guess What?, originally uploaded by Erin *~*~*. I smell strawberries!, originally uploaded by Erin *~*~*. 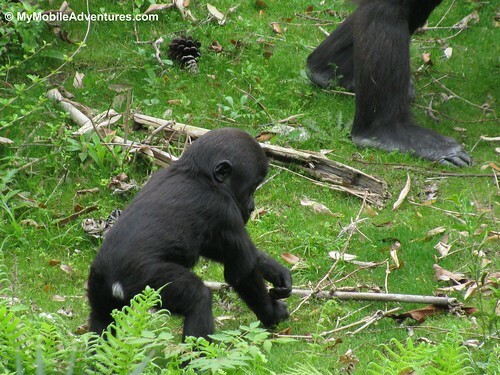 And now I’m headed over there to smell the jacaranda. 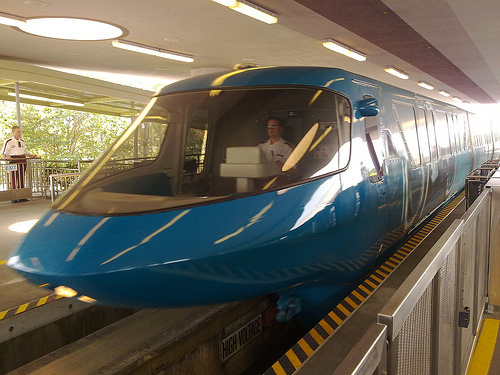 Our chariot to EPCOT pulls into the station, originally uploaded by Erin *~*~*. Sista Sufferagette!, originally uploaded by Erin *~*~*. "Those who do not believe in women’s rights should watch out for women’s LEFTS!" 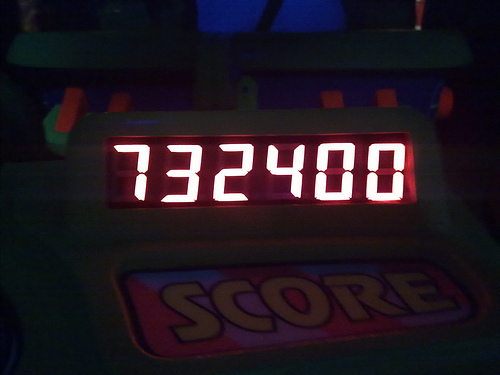 Buzz Lightyear – my score, originally uploaded by Erin *~*~*. The view from the TweepleMover, originally uploaded by Erin *~*~*. 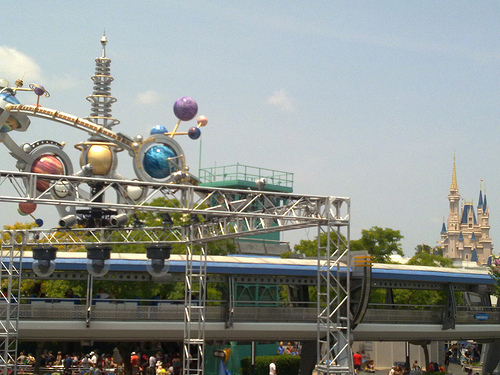 Wow talk about a successful "point and pray" shot – castle AND Astro Orbiter in one swell foop! 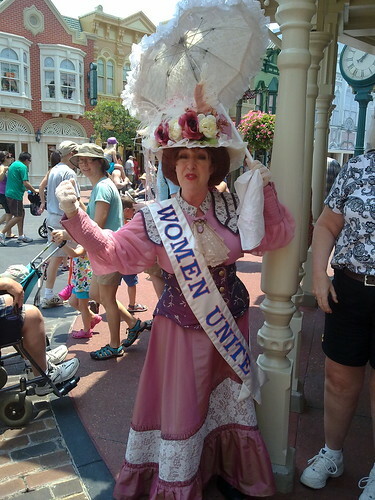 Gratuitous rose shot from the Magic Kingdom, originally uploaded by Erin *~*~*. Spring time in the Magic Kingdom, originally uploaded by Erin *~*~*. 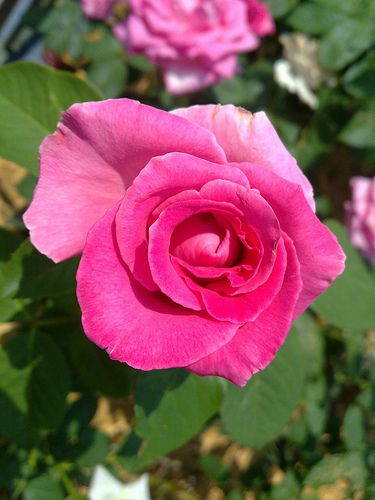 Heading through the Rose Garden, which is in full bloom. It looks and smells heavenly, a sharp contrast to my last trip to theWorld back in March. 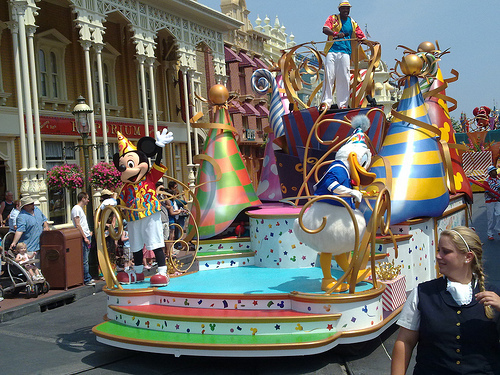 Get a hug from Mickey Mouse! 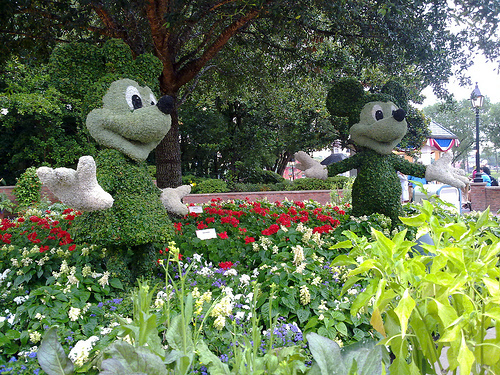 Get a hug from Mickey Mouse!, originally uploaded by Erin *~*~*. 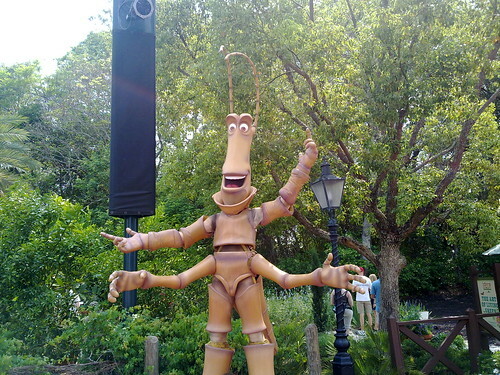 Doesn’t it look like he’s ready to hug us all? love this parade more and more each time I see it. Attn: @DisneyParks – this is VERY disappointing! 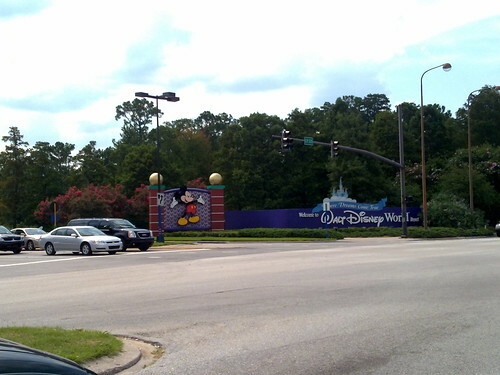 Attn: @DisneyParks – this is VERY disappointing!, originally uploaded by Erin *~*~*. 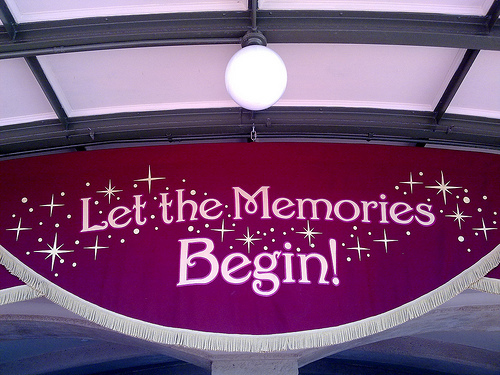 What a shame that Disney decided the world needed yet another character meet. They deleted the actual THEATER to make room for it. 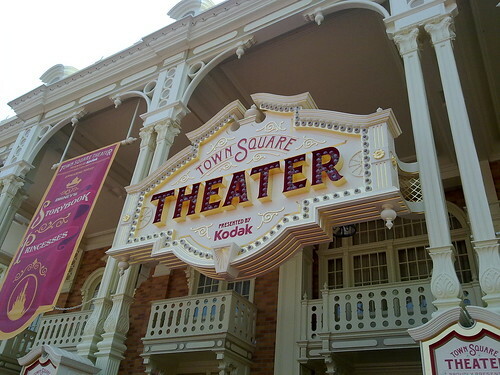 This sign is therefore erroneous; there’s no theater inside. 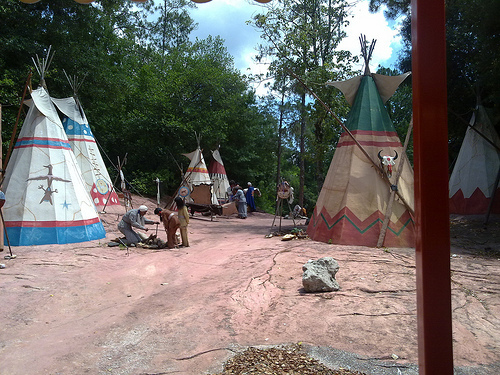 Magic Kingdom refurb continues, originally uploaded by Erin *~*~*. 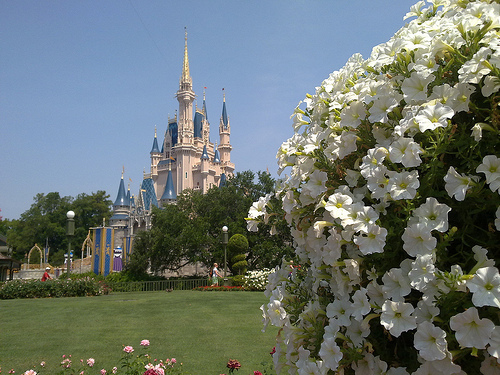 Today’s Agenda: Magic Kingdom, originally uploaded by Erin *~*~*. 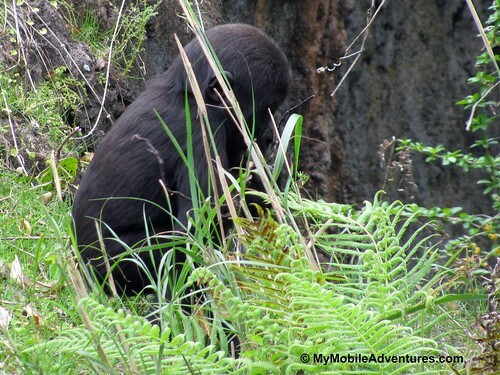 I had the misfortune of checking email and finding that I had a mission to complete which was heretofore unknown. 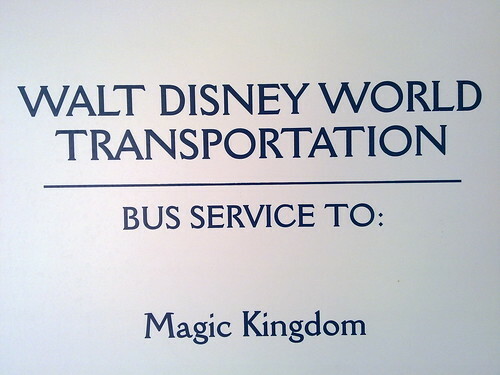 So I did that and now I am at the bus stop waiting to get to the Magic Kingdom. My compatriot is already there and has declared it "not crowded". Hopefully it will remain that way for a while. 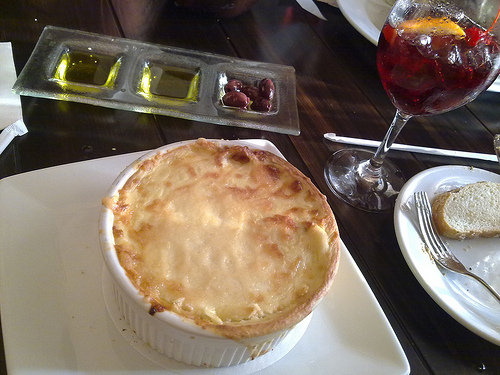 Cat Cora’s Greek lasagne, originally uploaded by Erin *~*~*. 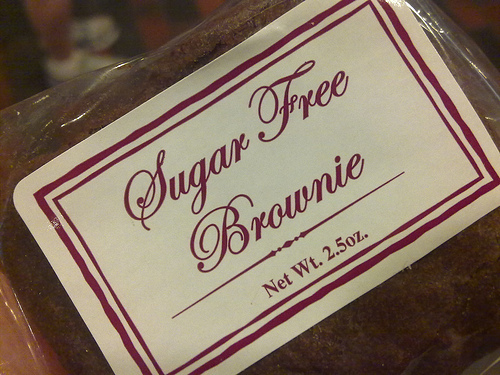 This was really good but I could only eat half of it. There is a child-sized portion on the kid’s menu that would have been much better. 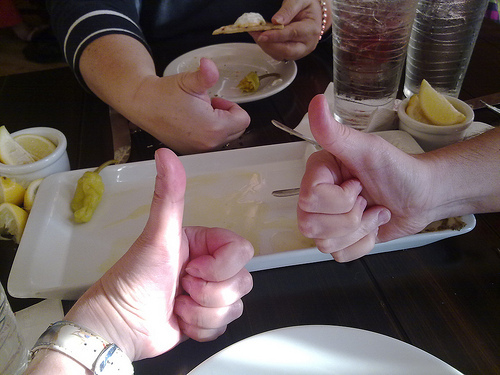 Kouzzina appeyizer – three thumbs up, originally uploaded by Erin *~*~*. Who stole the rest of the crayons! Who stole the rest of the crayons!, originally uploaded by Erin *~*~*. 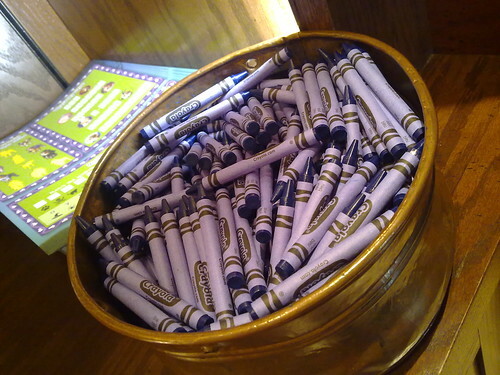 Our restaurant only has blue crayons.